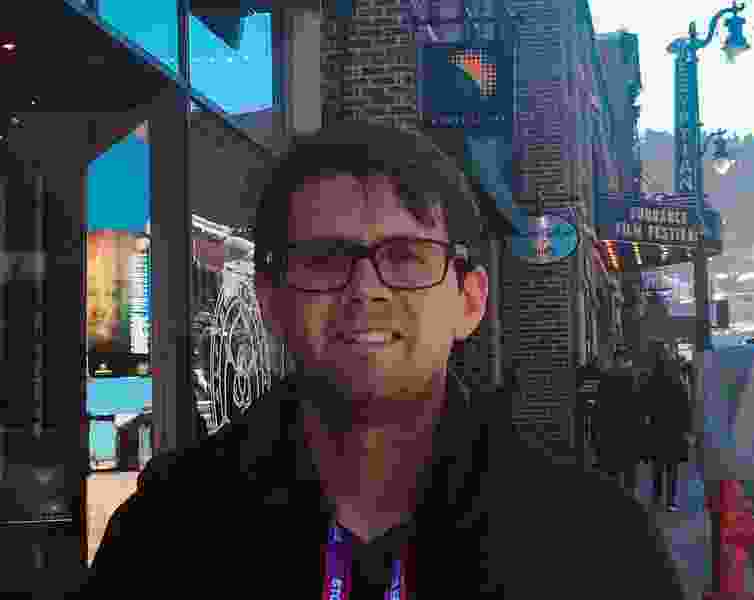 (Sean P. Means | The Salt Lake Tribune) Composer Chad Cannon, photographed on Park City's Main Street on Friday, Feb. 1, 2019. Cannon, a Salt Lake City native and Highland High School graduate, composed the score for the documentary "American Factory," which premiered at the 2019 Sundance Film Festival. He had been contacted last summer about working on the documentary, but only saw the first cut of the film in November, as directors Steven Bognar and Julia Reichert rushed to get the film ready for the 2019 Sundance Film Festival. He got the final cut on Dec. 17, leaving him three weeks to compose, orchestrate and record the score before sound mixing in time for the premiere. “My holidays were very stressful this year,” said Cannon, a Salt Lake City native and Highland High School graduate now living in Los Angeles — though he still has the 801 area code on his cellphone number. (Ian Cook | Courtesy of Sundance Institute) Rob Haerr, left, and Wong He are unexpected co-workers at an Ohio auto-glass plant begun by a Chinese billionaire in "American Factory." The film by Steve Bognar and Julia Reichert is an official selection in the U.S. Documentary Competition of the 2019 Sundance Film Festival. “American Factory” traces the opening of the Fuyao Glass America factory near Dayton, Ohio, on the site of a GM assembly plant that closed in 2008. (Bognar and Reichert chronicled that closure in “The Last Truck,” an Oscar-nominated documentary.) The new movie captures the early optimism and culture clashes as Chinese auto-glass manufacturer Fuyao and its billionaire chairman, Cao Dewang, try to adjust to American labor practices. Cannon, 33, connected with Bognar and Reichert through a 2016 Sundance Institute Composers Lab at the Skywalker Ranch in California. The lab works with filmmakers, composers and sound mixers to find the best ways to meld music to film. A documentary about a Chinese company investing in an American manufacturing plant seemed to fit well into Cannon’s expertise. When he was studying at Harvard, he did music studies in Okinawa, Japan, and in Fujian province in China — which happens to be the home province of Cao and Fuyao. Cannon also served a mission in Japan for The Church of Jesus Christ of Latter-day Saints. “It just so happened there was a nice connection,” he said. Ultimately, even though Cannon offered to enlist Fujian musicians to bring a Chinese flavor to the score, the directors opted against it. “Julia and Steve, in the end, said, ‘We don’t want any Chinese music in it. This is an American film,’” Cannon said. The directors wanted a specific sound for the music and played a Mozart woodwind serenade as an example. “I usually don’t get very specific orchestration requests from directors, but in this case they wanted that,” Cannon said. At one point, because it’s a glass factory, he experimented with glass instruments. “I got all the bowls and cups, and all this glass in my house, and recorded a bunch of percussion,” he said. He also recorded samples of a glass armonica, a mechanical instrument invented by Benjamin Franklin made of spinning glass discs that is played by wetted fingertips. “They ultimately thought it was too twinkly,” Cannon said. The low woodwinds worked, he said, because they were a counterpoint to the omnipresent factory noise in the film. Cannon said the movie’s sound designer visited the Moraine plant for three days to record the ambient sound. The documentary ends with Cao touring the Moraine factory, discussing ways to bring automation to replace human workers at different parts of the manufacturing process. Cannon said he could relate to the scene, because film composers face a similar dilemma: choosing between electronic samples and instruments played by live musicians. Cannon said 95 percent of the music in “American Factory” was recorded live, with musicians playing the instruments. “The human touch with melodies and stuff, you just can’t beat it,” he said.